I have published a number of academic papers on my research. Many of these are open access and are freely available to the public. I have also authored a number of reports and research notes of interest to wider audiences. Dommett, K. and Power, S. (Forthcoming) 'The Political Economy of Facebook Advertising: Election Spending, Regulation and Targeting Online', Political Quarterly. Dommett, K. and Temple, L. (Forthcoming) 'The Expert Cure? Exploring the Restorative Potential of Expertise for Public Satisfaction with Parties', Political Studies. Dommett, K. (2018) ‘Roadblocks to Interactive Digital Adoption? Elite Perspectives of Party Practices in the UK’, Party Politics, forthcoming. Available here. Dommett, K. and Temple, L. (2018) ‘Digital Campaigning: The Rise of Facebook and Satellite Campaigns’, Parliamentary Affairs, forthcoming. Available here. Dommett, K. and Rye, D. (2017) ‘Taking up the baton? New campaigning organisations and the enactment of representative functions’, Politics, Online Early View. Available here. Dommett, K. (2016) ‘Post-Democratic Party Politics?’, Political Quarterly, 87(1): 86–90. Available here. Dommett, K. (2015) ‘Ideological Quietism? Ideology and Party Politics in Britain’, Political Studies, 64(1): 106-122. Available here. Dommett, K. (2015) ‘The Theory and Practice of Party Modernisation: The Conservative Party under David Cameron, 2005–2015', British Politics, 10(2): 249–266. Available here. Boswell, J., Corbett, J., Dommett, K., Flinders, M., Jennings, W., Rhodes, R.A.W. and Wood, M. (2017) ‘What can political ethnography tell us about anti-politics and democratic disaffection?’. European Journal of Political Research. ​Available here. Dommett, K. (2017) ‘United Kingdom’, European Journal of Political Research Political Data Yearbook. Available here. Geddes, M., Dommett, K. and Prosser, B. (2017) ‘A Recipe for Impact? 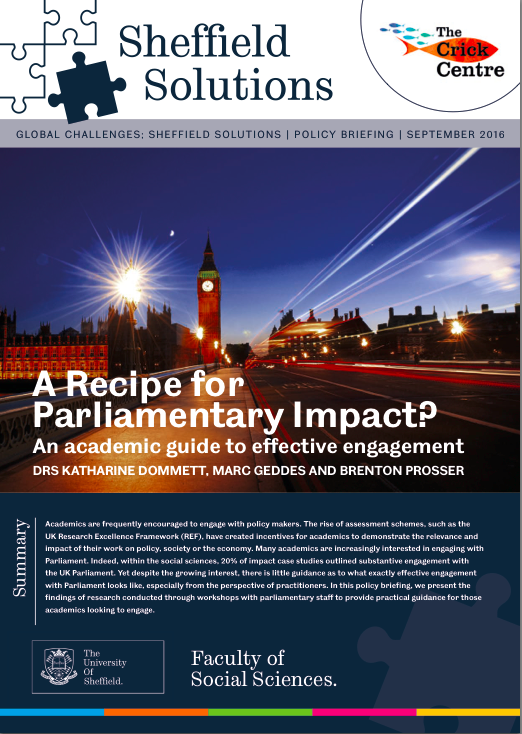 Exploring knowledge requirements in the UK Parliament and beyond’ Evidence and Policy. Available here. Dommett, K., Hindmoor, A., and Wood, M. (2017) ‘Who meets whom: Access and lobbying during the coalition years’, British Journal of Politics and International Relations, 19(2): 389-407. Available here. Dommett. K, (2015) ‘Clown Prince or Party Saviour? Exploring the Oratory of Boris Johnson’ in R. Hayton and A. Crines (eds.) Orators in Conservative Party Politics, Manchester: Manchester University Press, pp.166-181. Dommett. K, (2014) ‘Rhetoric and Party Politics: Looking Beyond the Leader’ in Atkins. J, Finlayson. A, Martin. J, and Turnbull. N (eds. ), Rhetoric in British Politics and Society, Basingstoke: Palgrave Macmillan, pp.73-86. Flinders, M. and Dommett, K. (2013) ‘Gap Analysis: Participatory Democracy, Public Expectations and Community Assemblies in Sheffield’, Local Government Studies, 39(4): 488-513. Available here. Dommett, K. and Flinders, M. (2014) ‘The Politics and Management of Public Expectations: Gaps, Vacuums and the 2012 Mayoral Referenda’, British Politics, 9(1): 29-50. Available here. Dommett. K, (2013) ‘A Miserable Little Compromise: Exploring Liberal Democrat Fortunes in the UK Coalition’, Political Quarterly, 8(2): 218-227. Available here. Dommett, K., McCarthaigh, M., and Hardiman, N. (2016) ‘Reforming the Westminster Model of Agency Governance: Britain and Ireland after the Crisis’ Governance, 29(4): 535-552. Available here. Dommett, K. and McCarthaigh, M. (2016) ‘Quango reform: the next steps?, Public Money and Management , 36(4): 249-256. Available here. Dommett, K. and Flinders, M. (2015) ‘The Centre Strikes Back: Meta-Governance, Delegation, and the Core Executive in the United Kingdom 2011-2014’, Public Administration, 93(1): 1-16. Available here. Dommett, K. and Skelcher, C. (2014) ‘The Micro-Politics of Agency Survival: A Strategic-Relational Analysis of Quango Reform in UK Government’, International Public Management Journal, 17(4): 540-563. Available here. Dommett, K. and Flinders, M. (2014) ‘The Politics of Quangocide’, Policy and Politics, 43(1): 3-25. Available here. Dommett, K., Flinders, M., Skelcher, C. and Tonkiss, K. (2014) ‘Did they ‘Read before Burning?’ The Coalition and Quangos’, Political Quarterly, 85(2): 133–142. Available here. Flinders, M., Dommett, K. and Tonkiss, K. (2014) ‘Bonfires and Barbeques: Coalition Governance and the Politics Of Quango Reform’, Contemporary British History, 28(1): 56-80. Available here. Dommett, K. and Power, S. (2018) The Membership Journey, Sheffield Solutions Policy Brief. Dommett, K. and Flinders, M. (2015) Building Effective Democracies: The Role of UK Political Parties: A Report for the Westminster Foundation for Democracy.